Worldwide, Breast cancer is the most common invasive cancer in women. It affects about 12% of women worldwide. The statistics are appalling to even be this high as the part of the body affected in this cancer itself is seen as a stigma. As sensitive as the topic may seem, the disease certainly is not. Worldwide 4.4 million women live are living with breast cancer and with a million new cases springing up every year resulting in 4,00,000 deaths. Breast cancer is often a hereditary disease and it is the second leading cause of cancer death in women after lung cancer. The Edwin Smith Papyrus –an ancient Egyptian medical text describes 8 cases of tumors or ulcers of the breast that were treated by cauterization. The writing says about the disease, "There is no treatment." Mastectomy- the surgical procedure to remove the breast with cancerous lump, was performed at least as early as AD 548 when it was proposed by the court physician Aetios of Amida to Theodora. Those were historical, primitive methodologies by which surgeons of the age used to diagnose and treat a disease that was thought to develop due to imbalances of fundamental fluids running through the body. We have come a long way since then thanks to the technological and medical advancements in our modern day. Age is the most famously known risk factor of any type of cancer and to it is not new to the scene of breast cancer. Hormonal and lifestyle factors, gender, race, geography, benign breast disease, breast density, and family history are some of the other risk factors. Women with atypical epithelial hyperplasia have four to five times higher risk of acquiring breast cancer. Menopause is a major risk factor- women with early menarche have a higher risk of getting breast cancer and it all owes to the hormone secretion in the body of women, i.e women who have late menopause after around 55 years of age develop a higher risk of breast cancer but this is only natural. As far as gender is concerned, women develop breast cancer more often than men. The causes of this disease are still controversial, ranging from an unhealthy lifestyle to genetic conditions but biologically it is still unclear as to what exactly has to lead the human race with such a disease. While some people who develop cancer have previously never seen any risk factors, some with risk factors develop no cancer at all. It's likely that breast cancer is caused by a complex interaction of your genetic makeup and your environment. Lifestyle factors weigh in on the risk of developing this cancer in addition to getting it inherited thought bloodline. Causes include unhealthy lifestyle choices like low-fiber food, alcohol and tobacco consumption, obesity, lack of exercise, stress, having never been pregnant, having become pregnant at an older age and exposure to radiation. The stages of Breast cancer include four stages where stages 0 to 3 are pre-cancerous and having possibilities of having the cancerous lumps grow within the breast and stage 4 where there is no cure due to metastasis. 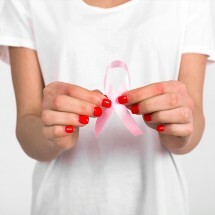 Prevention: Maintaining a healthy and balanced diet and lifestyle by incorporating exercise and high fiber foods, limiting alcohol consumption, limiting postmenopausal hormone therapy and medication, having breast awareness and self-screening, getting your breasts screened every year are some of the steps to be taken in the preventive notion. Wearing the pink ribbon proud is one way to spread awareness of breast cancer. For women with high risk of breast cancer, a preventive medication called chemoprevention and preventive surgery can be taken. Celebrities like Cynthia Nixon, Kathy Bates and in the recent news Angelina Jolie famously tested positive for BRCA mutations faced with the choice of removing her breasts. The process of diagnosis, treatment, and surgery takes a toll on the survivor physically and psychologically as cancer survivors claim. Still, to brave the world boldly after the disease, to have successfully gone through the procedure, it is a re-birth to women with a healthy, non-cancerous body all over again.